Danny Hylton has scored four league goals for Oxford United this season. 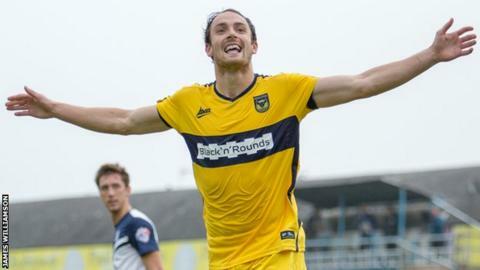 Danny Hylton's second-half penalty earned winless Oxford United an away point against Southend United. Hylton sent goalkeeper Daniel Bentley the wrong way after Luke Prosser was adjudged to have felled the striker. Teenager Jack Payne scored his first league goal to give the hosts a deserved first-half lead, drilling a low shot into the corner. Hylton was denied by Bentley's double save while Southend struggled to create anything clear cut after the equaliser. Midfielder Payne, who had only ever appeared as a substitute for the Blues in the league, was given a place in the starting line-up by Phil Brown after he impressed with two goals in the midweek defeat to AFC Wimbledon in the Johnstone's Paint Trophy. But his fine effort proved to be in vain as Hylton kept his composure to roll his penalty into the bottom left corner for his fourth league goal of the season, despite protests from the Southend players that he had gone down softly to win the spot kick. The draw means Oxford have now failed to win any of their six games this season and sit second-bottom of the League Two table, while Southend remain mid-table. Match ends, Southend United 1, Oxford United 1. Second Half ends, Southend United 1, Oxford United 1. Attempt missed. David Worrall (Southend United) right footed shot from the right side of the box is close, but misses to the left. Conor Clifford (Southend United) wins a free kick on the right wing. Substitution, Oxford United. Alfie Potter replaces Will Hoskins because of an injury. Attempt saved. Will Hoskins (Oxford United) right footed shot from outside the box is saved in the top centre of the goal. Substitution, Southend United. Kevan Hurst replaces Ryan Leonard. Attempt missed. Conor Clifford (Southend United) right footed shot from outside the box is too high. Substitution, Southend United. Barry Corr replaces Shaquile Coulthirst. John White (Southend United) is shown the yellow card. Goal! Southend United 1, Oxford United 1. Danny Hylton (Oxford United) converts the penalty with a right footed shot to the bottom left corner. Penalty Oxford United. Danny Hylton draws a foul in the penalty area. Penalty conceded by Luke Prosser (Southend United) after a foul in the penalty area. Attempt missed. Myles Weston (Southend United) right footed shot from the left side of the six yard box misses to the left. Shaquile Coulthirst (Southend United) wins a free kick in the attacking half. Attempt saved. Danny Hylton (Oxford United) left footed shot from the centre of the box is saved in the centre of the goal. Substitution, Southend United. David Worrall replaces Jack Payne. Corner, Oxford United. Conceded by Adam Thompson. Corner, Oxford United. Conceded by Daniel Bentley. Attempt saved. Danny Hylton (Oxford United) left footed shot from a difficult angle on the right is saved in the top centre of the goal. Attempt saved. Danny Hylton (Oxford United) right footed shot from the centre of the box is saved in the top centre of the goal.